After Hera Pheri, Akshay Kumar has dropped out of yet another franchise -- he will not be seen in the second installment of the 2002 crime caper Aankhen. The original director Vipul Shah will also give it a miss. John Abraham will replace Akshay in the sequel, which will be directed by Anees Bazmee, Akshay's Singh Is Kingg director. Incidentally, Singh Is Kingg was produced by Vipul Shah. With a chunk of the core team out, Aankhen 2 has gone for a complete change of profile. Anil Kapoor has been roped in to do a specially written character. In the original, Akshay, Paresh Rawal and Arjun Rampal played blind characters while Amitabh Bachchan's character could see. "John and two other heroes will play blind characters but Anil's character can see," confirms Bazmee. 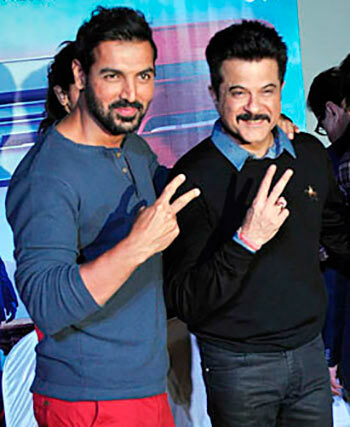 Anees' rapport with Anil was built during the shooting of Welcome and Welcome Back. "He has the energy level of a 24-year old. I had to have him in Aankhen 2," says Anees. The film's producer Gaurang Doshi is also trying to rope in two top heroines for Aankhen 2. Sushmita Sen, who starred in the original, will not be repeated in the sequel.